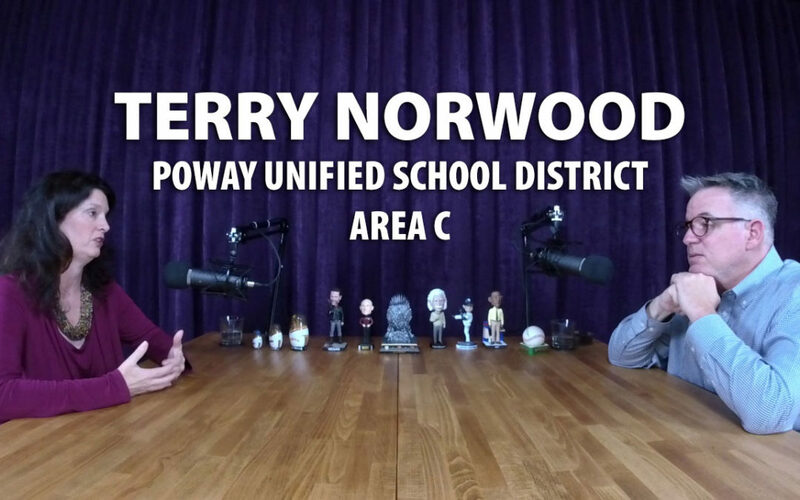 Terry Norwood joined me yesterday afternoon for pleasant conversation about her campaign for Poway School Board in Area C (mostly Rancho Bernardo). Terry has carved out a unique position in her race. She is the only challenger running against two incumbents. She is the only woman on the ballot. She is the only Rancho Bernardo resident in the race for a district that is primarily about representing Rancho Bernardo’s interests. Ms. Norwood has spent a great deal of her time as an active member in her community. She served as PTA President at Rancho Bernardo High School. She spent numerous years working on the Rancho Bernardo Grad Night event including one year as Committee Chair. She has served on the school site council at RB High. She serves on the Palomar PTA Council (the umbrella PTA organization for all of PUSD). She has served on the Rancho Bernardo Planning Commission and as a board member on the Rancho Bernardo Community Foundation. Plus she has great experience serving in organizations that support local military families. Her progression to become a candidate for school board is simply the next logical step in her journey to serve her community. Terry prides herself on out-of-the-box thinking looking for creative ways to bring new resources to help students in the classroom. She sees a great need for an active CTE (Career Technical Education) program (aka vocational education) to supplement the traditional college track courses in high school. We discussed the unique vocational programs available at various high schools that are simply under publicized and thus not offering the full potential of value for students in the area. She sees opportunities to bring in local businesses to offer internships, to coordinate resources to help students in specialized programs (i.e. robotics) and to offer training at school sites. While she will lobby Sacramento for more educational funding from the state budget, she wants to also maximize revenue sources available in our own backyard. We discussed her background growing up in Bell County Texas, living abroad in Sicily and on the western outpost of America along the Aleutian Islands of Alaska. This broad experience with different cultures and lifestyles gives Terry the ability to better empathize with the unique needs of students, teachers, parents, administrators and taxpayers of various backgrounds. Her race offered up many fascinating topics of discussion. She may be one of the few candidates in America that is facing off against TWO incumbents in the same race. Because of the challenging 3-2 majority dynamic on the board with her two opponents often on opposite sides of many key issues, this may open up a 4-lane highway down the center as she works to win the race. Terry hopes to capitalize on this anti-incumbency feeling amongst the electorate. I was particularly intrigued with her ideas to provide visual and performing arts not simply as a separate and distinct school program, but instead as an integrated and money-saving program that helps reinforce lessons in history, social science, literature and other disciplines (including special events like Grad Night). She strongly believes that different students learn differently, so different methods of teaching must be available (textbook, learning-by-doing, creative presentations, etc.). We also spoke about her learnings as a mother of a special needs student and how she can help PUSD with special needs education. Finally we also touched on the lack of long term planning at PUSD particularly with financial and safety matters. But that wasn’t all we addressed in this 2-hour discussion. I invite you to listen and watch as we covered other issues including Rancho Bernardo High School Principal David LeMaster, US Army, US Navy, basketball, tennis, strategies on breaking the 3-2 majority dynamic, how she will work together with other board members and provide stability, the Palomar College extension in RB, earning her college degree as an adult and mother of 2 children, growing up in a financially challenging environment, snow on the ground in June in Alaska, learnings from her PUSD race in 2016, the coming Blue Wave/Tsunami of 2018, Mother Theresa, converting pension programs to 401k plans, providing more resources in the classroom, education funding, solving the PUSD structural deficit, classroom sizes, excessive pay for associate superintendents, Troy Aikman, UCLA, Biola, Stanford, Billion Dollar Bond, excessive legal fees at PUSD, educating parents on opportunities for their children, parents getting a “seat at the table” with the board and administration, Hamilton and being a “Harrier Mom”.